I made these as well a few months ago! Here is my version using apple butter to replace some of the oil. Have you ever made muffin melts? They are a favorite in our home. I am not sure how you would freeze them, any suggestions? Do you serve all your muffins on the top of the fence posts? 🙂 Can’t wait to try them (muffins) out. Thanks! Haha! Love how you’re experimenting with the camera. Or was it really a picnic? I make these very similar except instead of the flour I use flaxseed meal and wheat bran. Healthy and delicious! I know there is a little blurb on the side of the flaxseed bag about using it as an egg substitute. I’ve used it before, but I can’t remember the specifics, something like 1 Tbs flaxseed and 3 Tbs water for each egg. I have used it before in baking and it always turns out great! I use to replace eggs with 1 tablespoon soy flour mixed with 2 tablespoons water. Whisk it together just like and egg before putting it in your recipe. I have a friend who is vegan, so when I wanted to make her some cookies, I had to find an egg substitute. I substituted 1/2 cup mashed banana for 2 eggs and they came out great. My family actually liked the oatmeal chocolate chip cookies better with the banana. So, you could try 1/4 cup mashed banana for each egg. My only concern (if I’ll make these I’ll be replacing the egg, too!) is that 3 eggs for 12 muffins is an awful lot of egg to be replacing. Usually the flaxseed substitution works beautifully, but I’ve never replaced more than 1 egg in a single batch of anything at a time. If you do it, please let us know how they turn out! You can also make these Paleo!! The are my favorite Paleo recipe thus far!! Would you be willing to share the recipe! Thanks so much! I ran out of carrots so I could not make this recipe today. But I will be trying it in the future. But I did make pantry muffin mix. I mixed up a strawberry and chocolate chip muffin mix, zucchini and chocolate chip muffin mix and a pear and cinnamon muffin mix. I made chex mix today. And I made 6 different kinds. No I did not intend to, but I kept seeing such good recipes I couldn’t stop until I ran out of time and energy. hehe. I still have 4 more recipes to try. Hehe. 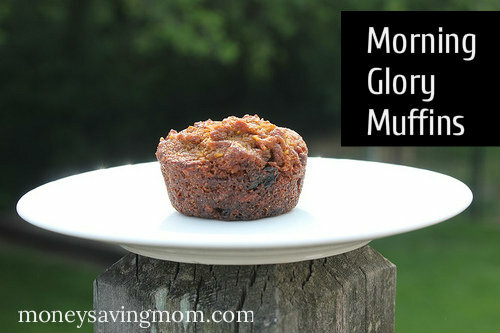 Those muffins look so delish….I’m going to have to print the recipe! I use a recipe very similar but use 1 cup grated carrots and 1 cup grated zucchini…so yummy! Both of them are VERY high in saturated fat… so NOT heart healthy. Check out this article on healthy fats! It is now understood that saturated fats are probably not unhealthy for the heart. Although if one already has heart disease saturated fat should be controlled. I made these many times before but added 3/4 cup applesauce and 1/4 cup oil (canola, vegetable, or whatever I have on hand but no olive). Never tried cocnut oil but will have to next time. My picky kids LOVE them and usually want butter on the muffins but they eat them plain. These sound very yummy! I love . I sliced up some bananas and flash froze them for smoothies. That is the extent of my freezer “cooking” today. These look great! Excited to try them. Is the yield ~24 muffins (guessing from the pictures)? Hopefully I’m not overlooking that in your post but didn’t see it. Thanks! Your website always inspires me – I used to make and freeze muffins frequently but I’ve dropped the habit – thanks for the reminder 🙂 They’re such a great quick snack. These look great! I may have to try them after we run out of banana bread. I’ve been working on dinners this week, preserving some of the herbs that I grow. It’s been a good week! Wow! so many good things in these muffins! my family will love them! You’re really becoming quite the photographer! Would you mind sharing what kind of camera you have? I’m looking at purchasing one. Thanks! After you posted that you were going to be making Morning Glory Muffins, I got a real hankering to make some. I checked out the recipe you used and it is almost the exact same recipe as the one I use from a bakery cafe cookbook my mom gave me when I got married. The only difference is my recipe includes 2 tablespoons buttermilk (i just use milk and a drop of lemon juice). I think it makes a difference too! As to the healthiness of all that sugar and oil, I like the way you tweaked them. I did the same only I replaced half the oil with mashed sweet potatoe. Next time I’ll use apple sauce. I used 3/4 c sugar and they were plenty sweet. I will say they turn out for me with a kind of caramelly crunchy outside that i love when I use the full 1 1/4 c sugar the orignial recipe calls for (if i use no liner. Cool! I’ve got lots of sweet potato frozen and would love to replace part of the oil with it. Did they end up sticking? Would you use sweet potato again? I have been motivated by you to be cooking all this week, though I missed the first two or three weeks 🙂 Yesterday, I baked two chickens, shredded the meat, made a bean mix for the freezer, and packaged four lunches (3 fried rice, and 1 BBQ chicken for sandwiches). Your muffins look yummy! I’m a bit behind on the challenges (sigh), but I made the chocolate chip oatmeal cookies today. I can’t wait to try them tonight! I tried your meatballs and lasagna casserole for freezer cooking this week. Can’t wait to eat them! Thanks for all the inspiration. I just made these and they are delicious! I did replace half of the coconut oil with applesauce and use the 3/4 cup sugar. I may even cut it down a bit to 2/3 or less next time. Thanks for sharing!